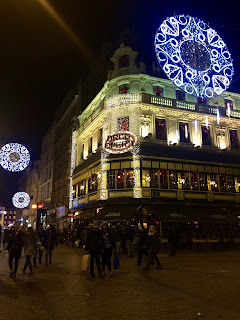 In my last post, I spoke about a website/app I use when I'm searching for a new place to visit, but am not quite sure where to go. 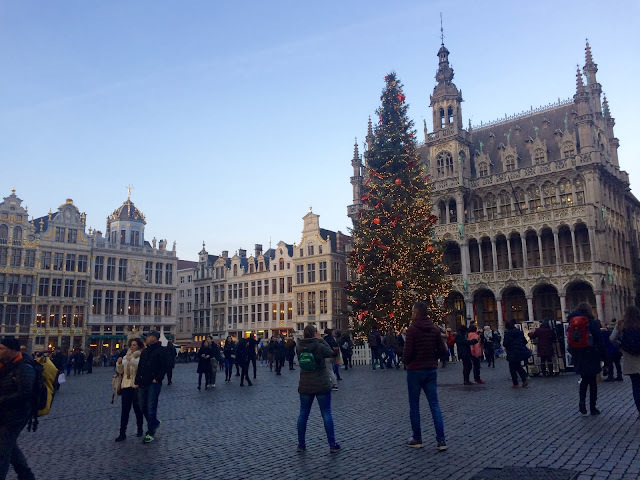 Before a long weekend I had back in December, Odaliz and I looked on Skyscanner and found an inexpensive flight to Brussels (after Tallinn, inexpensive was key!). Neither of us wanted to go on a long trip, but we knew we wanted to go somewhere for a few days. 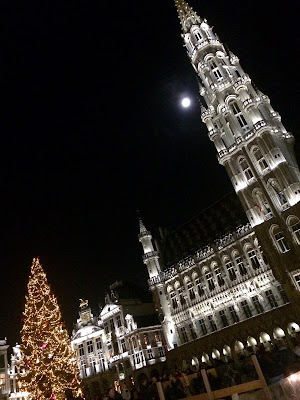 Between the price and the promise of Christmas Markets, Brussels was calling our names! 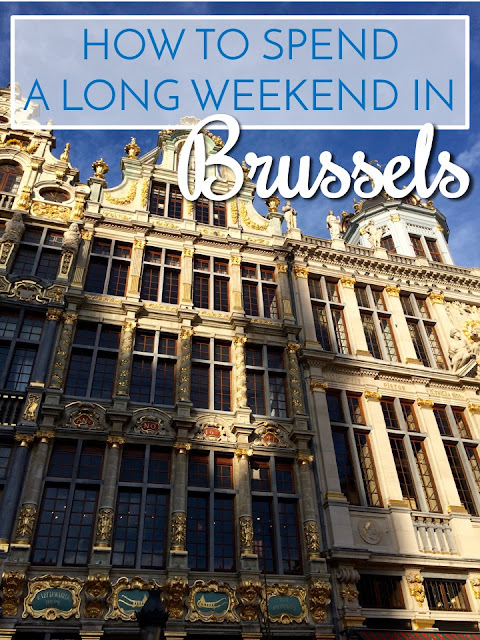 Brussels was the perfect long-weekend city. It's small enough that you can get the feel of it in just a few days, but there is plenty to do. 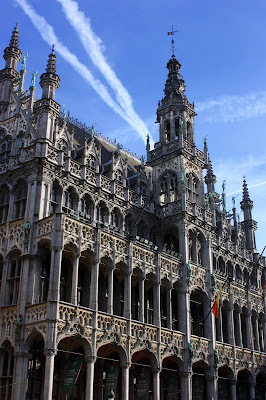 I would have loved to stay even longer and make a few day trips out to Ghent or Bruges, but this time stuck to just Brussels. 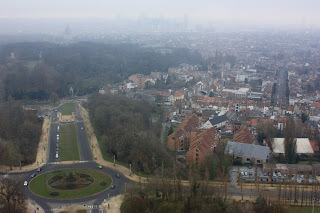 Everywhere we went we heard French, though official languages also include Dutch and German. Fun fact: Of Brussels' 176,124 inhabitants (as of October 2015), 63,757 are international/foreigners! That's over a third of the population! Other fun fact: My idol, the late, great, Audrey Hepburn, is from Brussels! We were treated to the loveliest surprise one night while admiring the view from the center of the plaza. As we struggled to take an "In Front of the Tree Selfie" (which we never succeeded in getting), the lights suddenly all went out. A second of confusion, another second of worry, and then the plaza filled with loud music, accompanied by a light show on the faces of the buildings surrounding us! It was completely breathtaking. I cannot imagine the amount of work that must go into perfectly timing the lights not only to appear and disappear in sync with the music, but also in perfect harmony with the different shapes, windows, and details of each building! There was one point that was disorienting because the lights were flashing red and blue, making it feel like parts were popping out and changing shape! I didn't manage to get very good videos because the entire show was almost hypnotizing, but I will never forget standing next to that giant Christmas tree with such awe. While Brussels is a government headquarters, home to the European Commission, European Parliament, the headquarters to NATO, even the capital of the European Union, it is not a humorless city- far from it! One of the city's main tourist attractions is a hilarious and slightly ridiculous bronze statue of a little boy peeing into a fountain. Dressed up in seasonal costumes regularly, stolen and recovered multiple times since it's creation in 1619, this little guy has been through it all. Legends of his origin vary, but are all fascinating. One tells of a two year old lord in 1142, brought into battle by his troops and placed in a tree to keep safe, as well to boost morale. 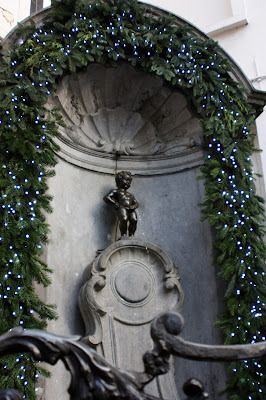 The little lord supposedly urinated down on the opposing troops, and now reigns as a symbol of just how the Belgian people feel about would-be-oppressors. Another tells of yet another siege, this one during the 14th century. The attackers planned to use explosives to gain control of the city, but were unaware they were being spied on by a little boy named Julianske. He peed on the fuse, saving the city from disaster. There are many more, but I like these ones the best, as they speak to the rebellious and resilient nature of the city. 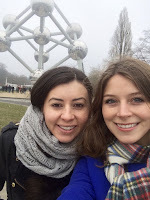 Standing at an incredible 335 feet tall, The Atomium has been a symbol for Belgium and for Brussels since it was first erected in 1958 for the World Fair. The original plan was that the installation would last for 6 months, but it was so popular that it has stood for nearly 60 years! 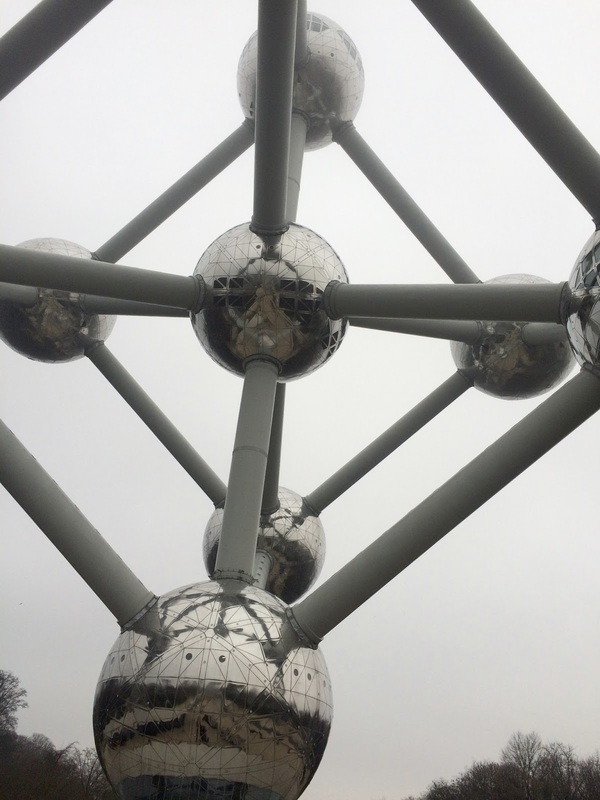 Each of the nine spheres span 60 feet in diameter, representing the nine atoms of a iron crystal unit cell, magnified to 165 billion times its actual size. Five of the spheres are open to the public and used as a museum, with the top sphere offering what might be the most impressive panoramic view of Belgium. The lines look long, but move quickly. 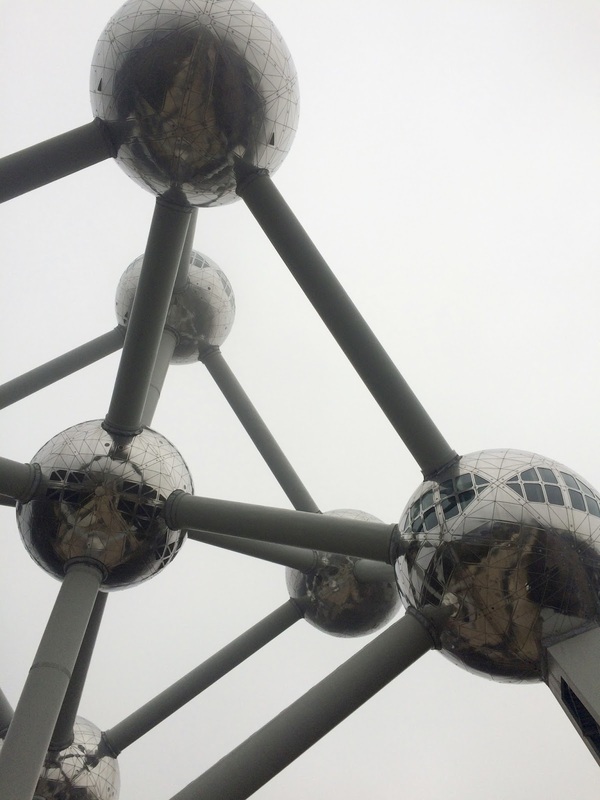 Our view was marred by the day's gloom, but the structure was very impressive, and it was interesting to wander around the outside, as well as inside the spheres. Oh my gosh, Odaliz and I stumbled upon the most beautiful shopping center- the Galleries Royales Saint Hubert. The stunning gallery reminded me of Milan's Galleria Vittorio Emanuele, but I read that Brussel's Gallery was the first of it's kind, dating back to 1847- even before Vittorio Emanuele! 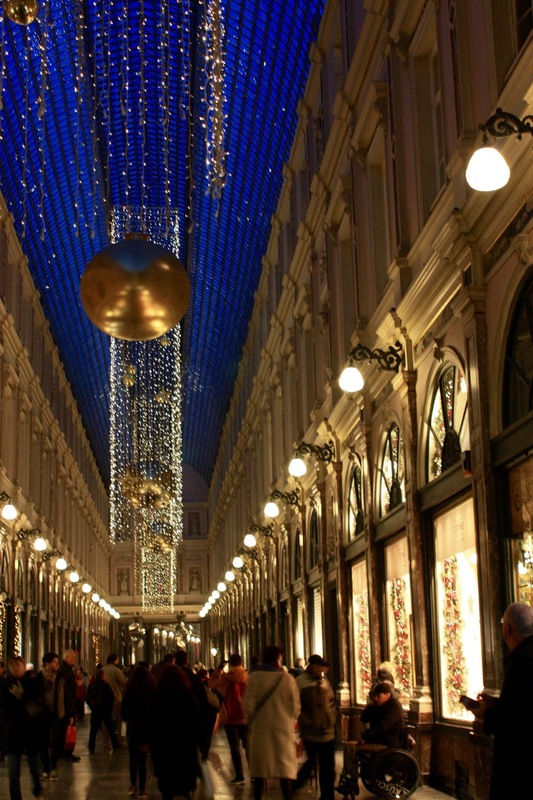 The vaulted glass ceilings, which looked bright blue in the evening light, made it Europe's the first covered shopping gallery. Every shop called to us with festive, sparkling window displays. We went into a few; a lovely chocolate shop that glittered with sparkling candies and adorable little tins (for some reason, I LOVE tins! ), and an amazing jewelry shop where I literally wanted to buy everything. 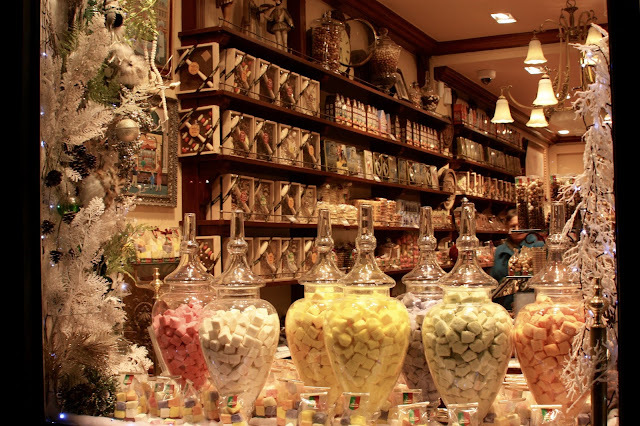 Seriously, I was completely obsessed with everything at Les Néréides, and when you hear this you'll get why: Every single piece was either fairytale inspired, or bright, delicate flowers. After much deliberation, I picked up the prettiest pair of earrings, which make my ears look like a garden. Check it off The List! We gobbled up waffles both the first and last mornings in Brussels for breakfast, as well as sharing one for dessert the second day. Oh my gosh, they were everything I could have hoped for and more! There are two types of waffles to be on the lookout for, and I'd suggest trying both (obviously) for comparative purposes. 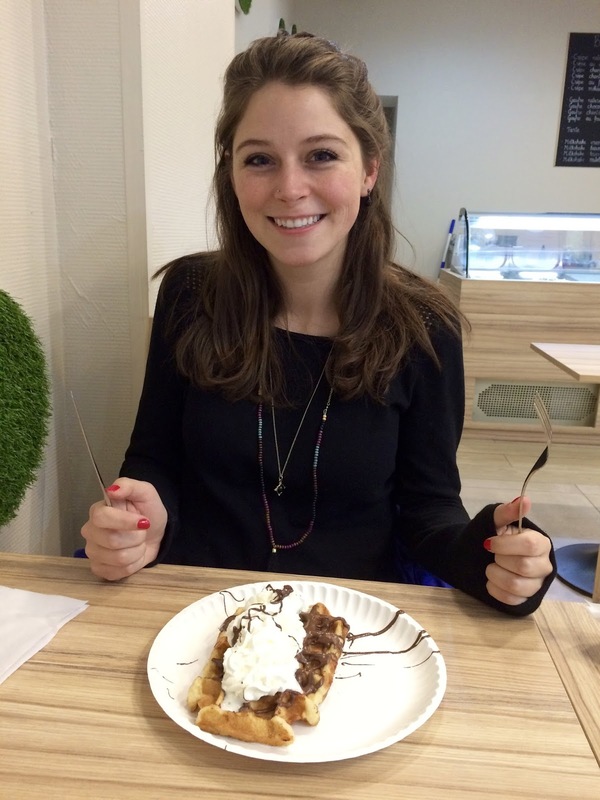 Brussels Waffles are thinner, lighter, have smooth, rectangular sides, and deep holes. 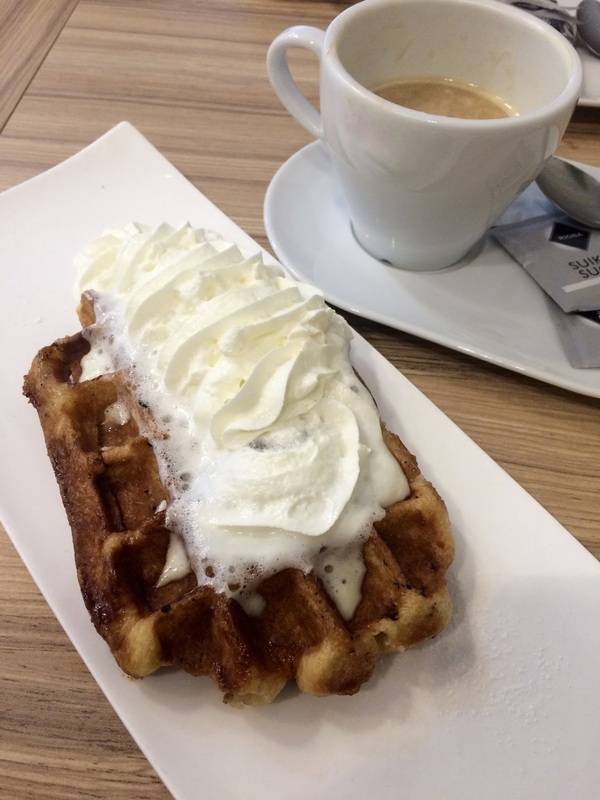 Liege Waffles are thicker and stickier, made with caramelized chunks of sugar that result in the most delicious sweet and crispy coating. They aren't quite as smooth as a Brussels waffle, and the edges are more uneven. Personally, I think I preferred the Liege waffle- every bite was so amazing, though I will say that I was so uncomfortably stuffed after eating one, which I didn't feel after a regular Brussels waffle. I'll leave you to make your own decisions. Whether you're a beer lover or not, there is something for everyone to try in Brussels. 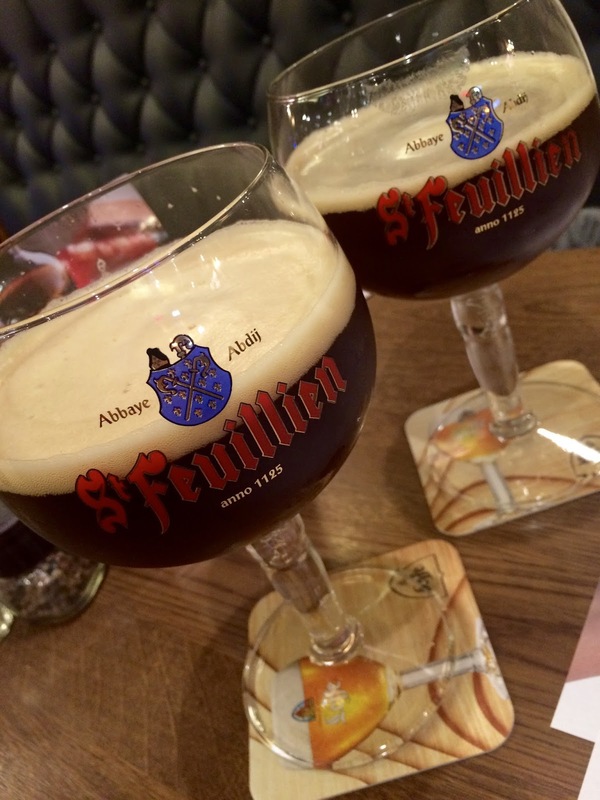 The best place to start is at Delirium Beer Bar, a quick walk away from the Grand Place. Like Temple Bar in Dublin, Delirium is really a small series of bars that appeal to different crowds, all offering a massive selection of beers. They earned themselves Guinness World Record recognition in 2004 with the greatest variety of beers available at a bar in the world- 2,004 types! Since then, they've added tons more and are now over 2,400! The atmosphere reminded me of a college bar, not fully due to the age of the crowd, but rather the friendly, loud, excited group of travelers. 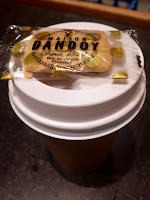 Anyways, as you could see, Maison Dandoy is the most delicious smelling, delectable-tasting shop I could ever imagine. I was so stuffed full of waffles that unfortunately I did not try one here, but it was a lovely spot to stop for a coffee and a few pieces of gingerbread, as well as to pick up a selection of cookies to bring home for my family. I especially loved the vanilla cookies, but you can ask for them to put together a bag with a variety if you'd like to try everything! 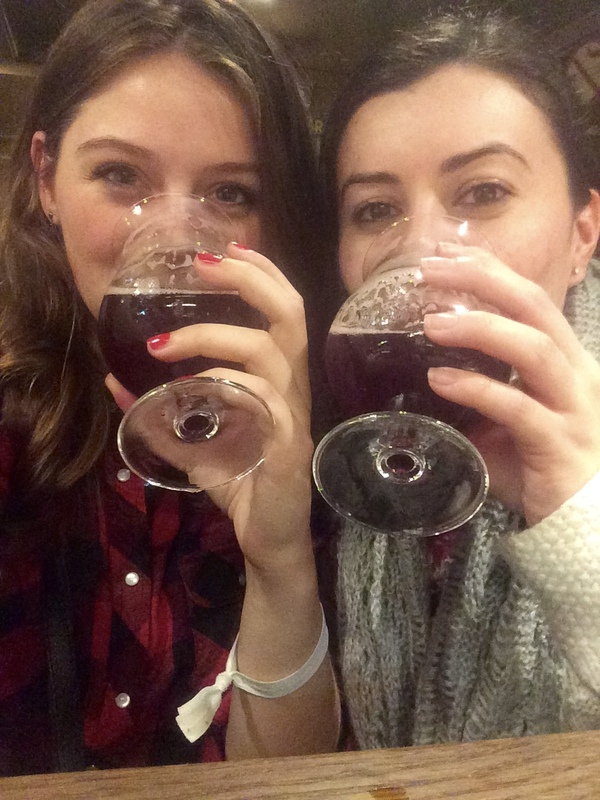 Who knew that trying mussels in Brussels was a thing to do?! I hadn't known, but moules-frites, or mussels and fries, is considered Belgium's national dish! 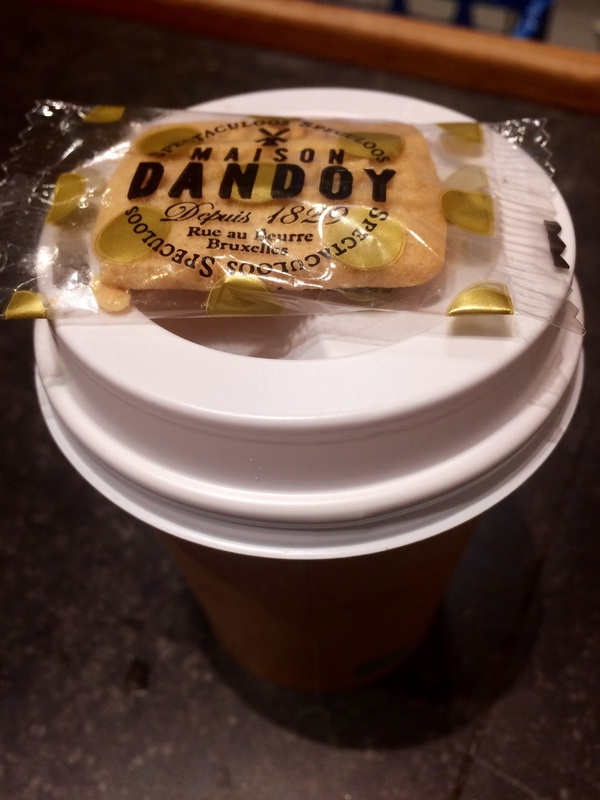 I'm trying my hardest as I've lived abroad to be less picky about what I eat. A few years ago, I don't think you could have paid me to eat mussels, clams, oysters, or anything of the sort. Now, however, I'm trying to be open to testing things out. I would hate to miss out on the experience just because I'm squeamish or picky! 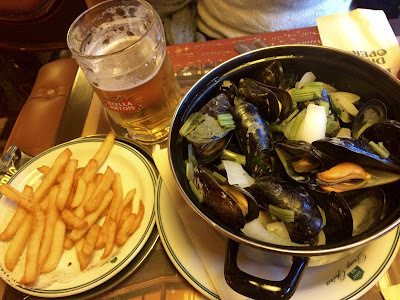 The fries are incredible, and I really enjoyed the mussels as well. 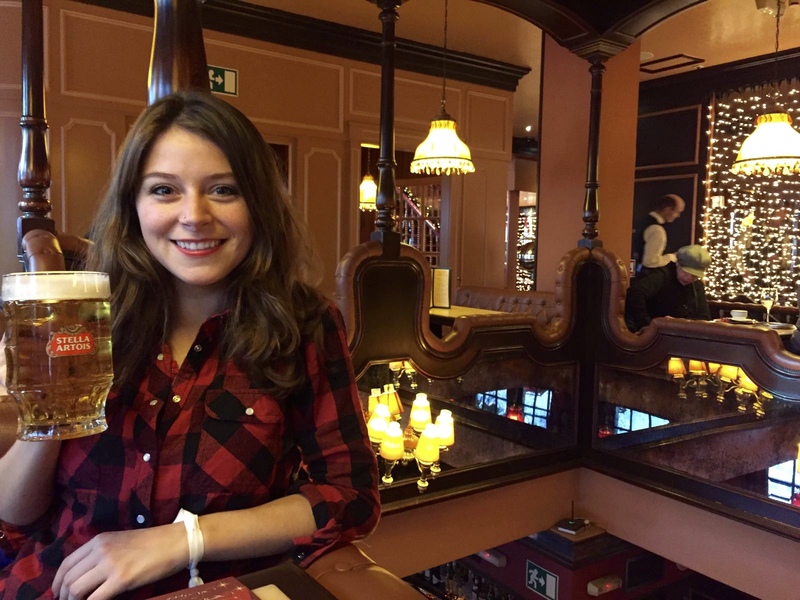 We stopped for lunch at Drug Opera, a beautiful restaurant in Brussel's city center. 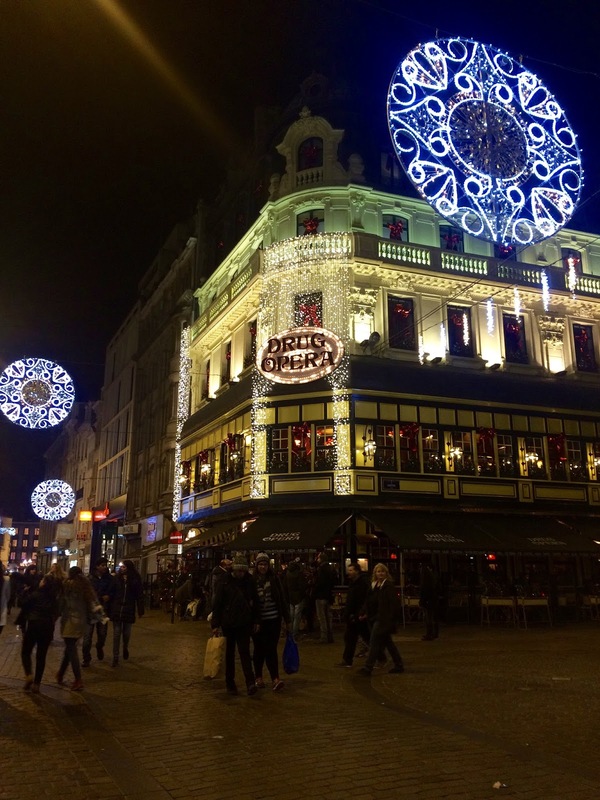 As we were visiting in December, the restaurant couldn't have been more festive, full of Christmas greenery and twinkling lights. The wood paneling gives it a cozy pub feeling, but fancier. I absolutely loved it! The portion of mussels was large enough for Odaliz and I to split (with tons left over), and we split a waffle as well, but as for fries... fries are not shareable. You can never have enough fries! Thanksgiving through New Years truly is the most wonderful time of the year! The festivity of the Christmas season is just pure magic. 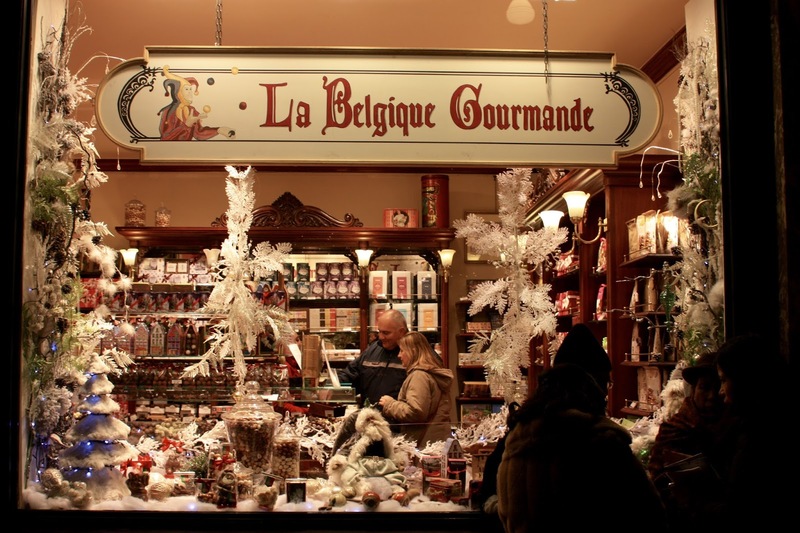 Though Skyscanner's prices were our initial draw to Brussels, another huge factor was the CHRISTMAS MARKET!! Oh my gosh, the smell of mulled wine, the twinkly lights, ice skaters, and booths that look like gingerbread houses... I just love them so much! I have to say, I didn't love the market in Brussels as much as I loved the ones in Germany or Estonia, but it was wonderful nonetheless. Besides the main market, there were other streets throughout the city lined with booths, as well as smaller markets spread throughout the littler plazas. 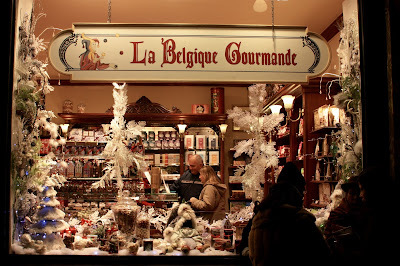 We found one with an Asian theme, where the little gingerbread booths sold noodles, and a place where you could buy Alsace-style mulled wine. At the main market we found the most interesting merry-go-rounds, with strange steam-punk style ships, planes, bugs, and other kooky seats for the kids to ride in place of the usual horses. Vintage images of naked women adorned the tops, which would NEVER fly on a kids ride in the USA, but while they were slightly creepy (for lack of a better word), they were also fascinating. One had a giant dinosaur whose back you could climb onto, as well as a spaceship and hot air balloon. I've never seen anything like it! Brussels is truly a great city for a few days of exploring. Small enough to feel comfortable, but large enough to never be bored, I left Brussels feeling like I'd seen a ton, but with a desire to return. Hopefully someday that will happen!